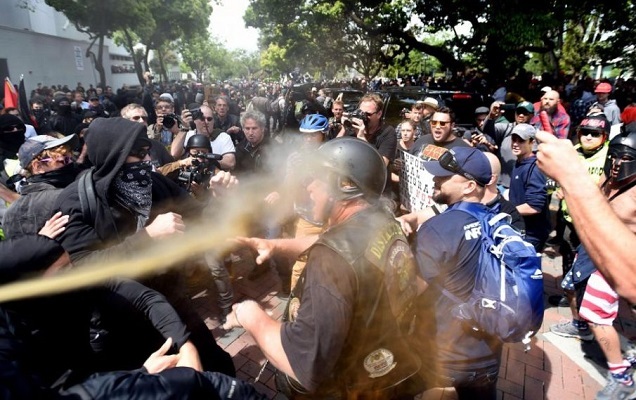 It’s past time for Antifa to be declared a domestic terror group and it’s past time for those masked terrorists to be rounded up and jailed every time they come out. 100%FedUp: Last week Trump supporters and leftist social justice warriors met on the political field of battle in Berkeley, California. Words were exchanged, as were punches. We covered the riots while they were happening in Berkeley. We also highlighted Louise Rosealma, an Antifa female who was punched by a Trump supporter. She claimed that she was punched after she was simply wandering and lost in the crowd (after traveling with her Antifa boyfriend to take part in the resistance movement against Trump supporters). It turns out she was carrying a wine bottle in her hand (she probably just forgot she had that in her hand) and was likely not a passive bystander at all. This poster is offered for sale on the website of the “Oak Roots Collective,” the same CA Antifa group the woman with the wine bottle in her hand and her boyfriend belong to. Louise and her Antifa boyfriend traveled to Berkeley with the intention of shutting down the free speech of Trump supporters, but ended up being surprised by the reaction from mostly male Trump supporters who were not in the mood to have their head cracked open because they hold an opposing political view. “Yes, we seemed to have lost today. The alt-right held their ground. If we wanna take action against them, we need to be better organized and better trained. It doesn’t help that it’s only the far left opposing them, any trump supporter can be radicalized far easier than any liberal.